Say yes to Michigan. But don’t say yaaaaaa. I came down to the basement to blog, and now my mother is sitting ONE INCH from my head, in the rocking chair next to the computer, hoping I can come up with a dinner plan for tomorrow. Okay, has she MET me? If it were up to me we'd all be eating Lean Cuisines tomorrow. So, my mother's dog attacked my dog. We were worried about this. We met in a park, hoping the neutral territory would make Gus less attacky. Instead, when my mother opened the back window of her SUV, Gus JUMPED out and directly onto Tallulah, and Tasmanian Devil-y said, "Rrrruuuruuublablablaruu!" We don't think teeth ever really entered the picture, but it was scary enough and now Gus is at the kennel. I used to like Gus. 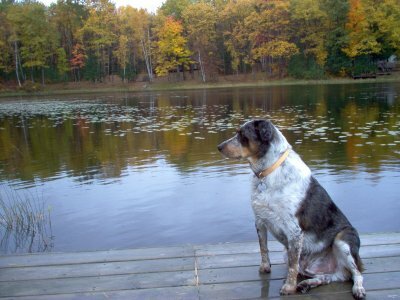 Here he is last fall, at my mother's place "up North," where we will be going without his bitey self in about an hour. Other than dog drama, things are fine. We went to a Greek restaurant last night and I had spinach pie and some sort of Greek potato thing and man, it was good. And yes, my mother-in-law DID run with me yesterday, and for whoever asked, she is in her mid-60s. She works out like 750 times a week. She'll go to three classes in a row at her gym and stuff like that. I know I am totally making her sound like an exercise bulimic right now, but she isn't. I had better go get ready to be northern now. I am interested in seeing whether Tallulah will swim. Oh, and I think I forgot to tell you that we pulled over to see Alpacas the other day, and Lula? Not such a fan of the Alpacas. I'm thinking her dream of retiring and owning an Alpaca farm will not work, seeing as every time she sees her moneymakers her hackles will go up like a pterodactyl and she'll say, "rrrrrrrrrrrrrRORRORORORORORORWWWW!gggrrrrrrrrrrr…"
That is the third dog sound effect in this entry. Oh, and speaking of sounds? People of Michigan? YOU DO NOT HAVE TO SPEAK THROUGH YOUR NOSES! Seriously! Try this. Say, "dot com." It is not "daaaat caaaaam." Really. You have a whole larynx and voice box and everything. Give your nasal passages a rest. I beg you. Now that the whole state hates me, I will go partake in your northern prettiness. In the caaaaabin. Next Post June, your 43-year-old blogging pal, returns. You didn’t stop by. Damn it. I’m your cousin, Karen and I live in Michigan and I’ve been told by other Michiganders, mind you, that I sound nasally. Let the first one amoung you cast the first nasal stone. Ummm… Happy Belated! I didn’t forget (how could I with so many reminders! ), but just didn’t get to the compy in time…. Hope it was happy! so. as a late birthday gift to you (the well-wishes were on time, it’s just the gift that’s late), i will allow you to edit my Freshman English paper. my teacher says it’s “not academic-level writing”…niiiice. way to break my heart. good thing he hasn’t seen my blog. Soooo………? Didja have a nice birthday and anniversary? You and Tallulah and your mom should come over and sign up for my latest giveaway. Tallulah might love it! Coming out of 1,000 years of lurking (in June terminology) to wish you a HAPPY BIRTHDAY. If I read nothing else during the day, I read your blog. It never fails to lift my spirits. You’re not only a fantastically funny, creative, down-to-earth and generous writer. You’re good medicine. Thanks. My Father always said, “we sound like the people on television” years later I realize he must have meant Canadian Television. Happy birthday!! 😀 You’re probably lounging up by the pond now, dipping your toes in the mud and sipping a drink with a little umbrella in it. Hope your Lean Cuisine today is extra delicious! Happy Birthday to the Favorite!!!! I am cracking up about the accents. I was born and raised in Georgia, so you talk about an accent. You know where I’m from the second I open my mouth. LOL! I’m the one asking how old your mother-in-law is, and I’m REALLY impressed with her running and all at her age, not that she’s THAT old, I’m just saying. Poor Gus, that young whippersnapper of a puppy invaded his space and he’s only trying to defend HIS property. Is today your birthday?? Happy Birthday!!! I thought I saw you last night, and I was about to yell out, “Bye bye pie lady!” but it was not you and I remembered you are very far away. My parents and all my grandparents are from MI. They sound normal to me, because I was not introduced to the yall/hey/and other southern goodness until kindergarten. Does your family say “hey” or do they say hello? Do they say pop? My family has trouble understand southern people. LOL, we are heading in that direction beginning tomorrow, with stops along the way to break up the trip and to take care of some family business. We will be in the general Traverse City area, can’t wait. I’m a native of MI and I THINK I have dropped some of the nasal after 20 years of being away. sorry about the dogs. Gus looks like a gorgeous creature. I remember years ago, my parents had a “Gus” and he and my dog, Teddy, took turns all day on Thanksgiving playing “King of the Deck” at my sister’s townhouse. At one point we had to search for my dog, he was hiding in the closet … they are social when you don’t want them to be and vice-versa. Wow, so sorry Gus turned predator! That is a gorgeous photo of him by the pond. The accent thing is funny. I’m so used to New England accents now that I don’t really hear them. Last time I was on the west coast I had a conversation with someone in a store – after I left the area my mom continued to chat with her. She came out and told me the woman was from Maine. I didn’t even notice! Sounded normal to me. Do you remember that one of the first things I noticed about people from Michigan was how nasally (is there such a word? ), they spoke!! Apparently you Michigan folks all thought I had an accent too. Does this mean that you sound Southern, now that you discern a different way of speaking in Michigan? Like you never spoke like that…. Thank God Lula is big – my heart dropped into my toes. A neighbors dog came into my yard and killed my sil’s dog I was babysitting – right in front of me – 30 years ago and I swear I have flashbacks still or ptsd what ever it’s called now. I think that’s why I always have fat dogs – I’m afraid to take them out of the house. Maybe everyone needs a little “pit” in them for survival! Welcome back to the mitten state. Last week we hosted Auntie M and Uncle Omar. Great times and shopping adventures. Auntie M got me ‘hooked’ on your blog. She spent much quality time with her other niece . . . who also LUUUVVVSSS bling-bling. Happy upnorth adventures.